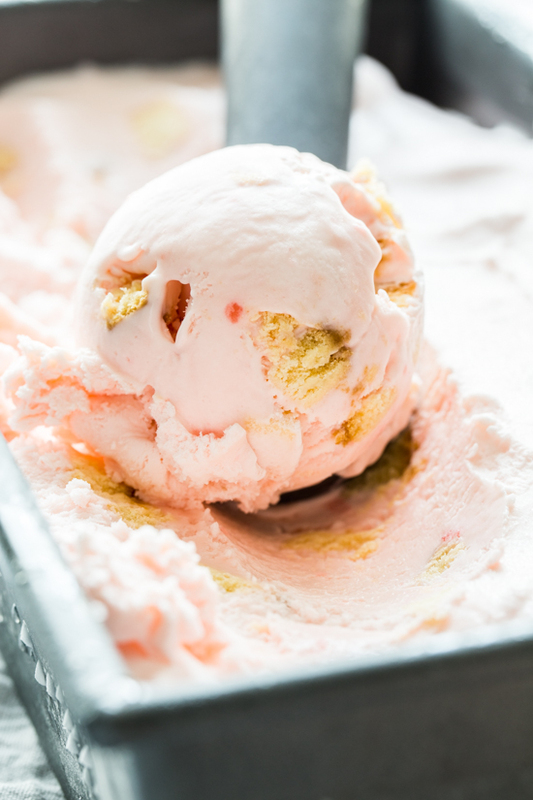 Marshmallow No-Churn Ice Cream made with Campfire® Marshmallows Pink Lemonade Mallow Bursts is sweet, creamy and a breeze to put together! Yes – it’s true. 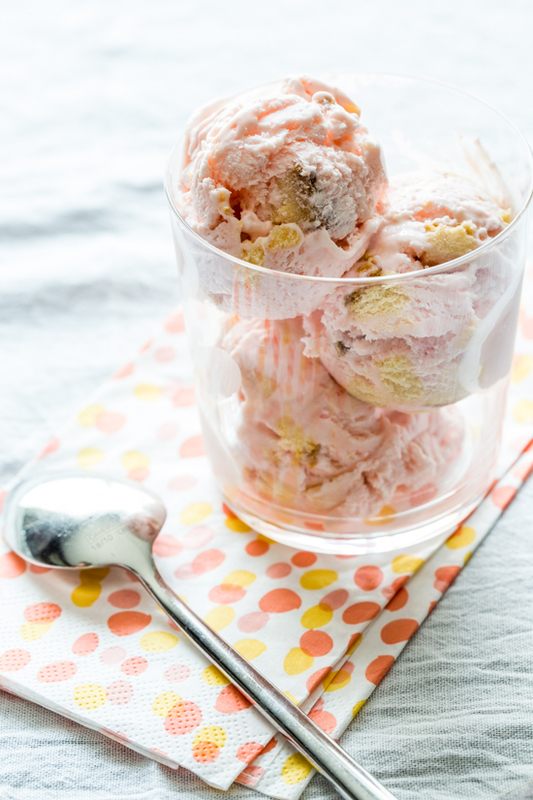 I’m sharing two no-churn ice cream recipes in a row. I can’t get over how cool it is that you can make incredibly sweet and creamy ice cream without using an ice cream machine. Don’t get me wrong, ice cream machines are great, but not everyone has one (**raising my hand**). Yesterday, I shared a quick and simple frozen banana ice cream which is really just one ingredient. Today, I have a very different recipe for you that has texture so much like traditional churned ice cream, you would never know that it wasn’t made with a machine. You’re going to love it! 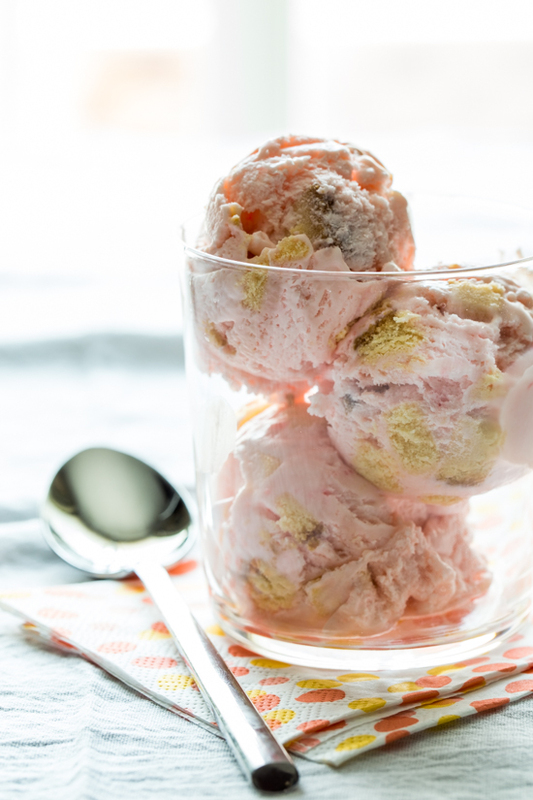 This Marshmallow No-Churn Ice Cream is pillowy, decadent and just plain amazing. I have seen this method of using whipped cream and sweetened condensed milk all over from Martha to Nigella. 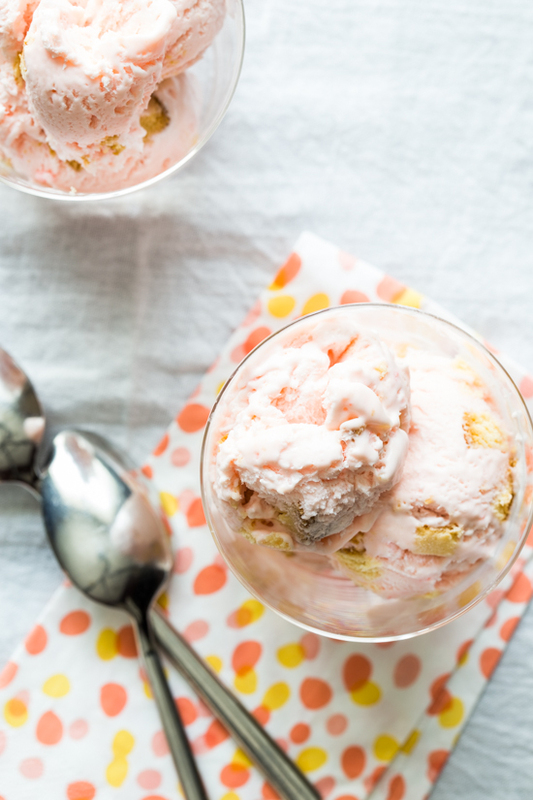 It’s basically those two ingredients: whipped cream and sweetened condensed milk but I wanted to turn it up a notch and use Campfire® Marshmallows Pink Lemonade Mallow Bursts to add sweet, citrusy flavor and fluffy marshmallow texture. The first time I tried these Pink Lemonade Mallow Bursts, I was blown away. They are so unbelievably flavorful, and forgive me the obvious analogy, but the flavor of pink lemonade just bursts in your mouth. Well, I wanted to round out the texture and flavors of this sweet, frozen treat with some little bites of pound cake. The resulting combo is nothing short of fabulous. My family went fairly nuts over this ice cream, it’s so good. What’s really wonderful is that these Mallow Bursts come in three more flavors: Key Lime, Lemon Meringue and Blue Raspberry. So yeah, I have some serious ice cream making on the agenda. Besides the great flavors, I love that Campfire® Marshmallows are made in a peanut free facility. With they Baby’s allergy, it can be difficult sometimes to find treats that aren’t processed with nuts. If you would like more information on Campfire® Marshmallows visit their website, Facebook page or Pinterest board. I’ve even started a Marshmallow Madness Pinterest board because with summer coming up, you can’t be too prepared for s’mores season, am I right? Would it be weird that s’mores are one of the main reasons I like camping? I hope not. Disclaimer: This post is brought to you by Campfire® Marshmallows. 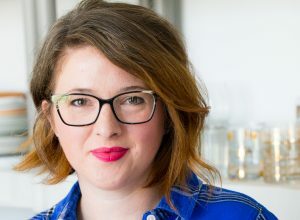 Thank you for reading and supporting the brands that I partner with in order to bring you quality content and recipes. All thoughts and opinions are, as always, 100% my own. In a large bowl, mix together sweetened condensed milk, vanilla extract and marshmallow flavored vodka and set aside. In the bowl of an electric mixer, whip heavy cream until stiff peaks form and set aside. Be careful not to over beat the cream. In a medium microwave safe bowl, place the Campfire® Marshmallows Pink Lemonade Mallow Bursts. Microwave on high in 30 second intervals until marshmallows are puffed and melty. Watch them carefully as to avoid any spills. Stir until smooth and allow to cool slightly. Spoon whipped cream into sweetened condensed milk mixture and fold in gently taking care not to deflate the whipped cream. Pour melted Mallow Bursts on top of that mixture and continue to fold in. Gently fold in pound cake and transfer ice cream mixture to a metal loaf pan. Freeze for at least 6 hours or until ice cream is firm. Scoop and serve! The small amount of vodka allows the no-churn ice cream to freeze to the perfect not too hard, not too soft texture. However, if you prefer to leave it out, the ice cream will still be incredible! I love this ice cream! Sometimes it is nice to skip the ice cream machine. And, I am super impressed with your video! So Fun! Thank you so much, Nicole! I had always been bummed because I didn’t have an ice cream machine, and frankly it’s just something that I hadn’t been able to justify the storage space, lol. I’m so glad there are such great work arounds to get crazy delicious ice cream without one. Thanks for stopping by!! This ice cream look delicious! 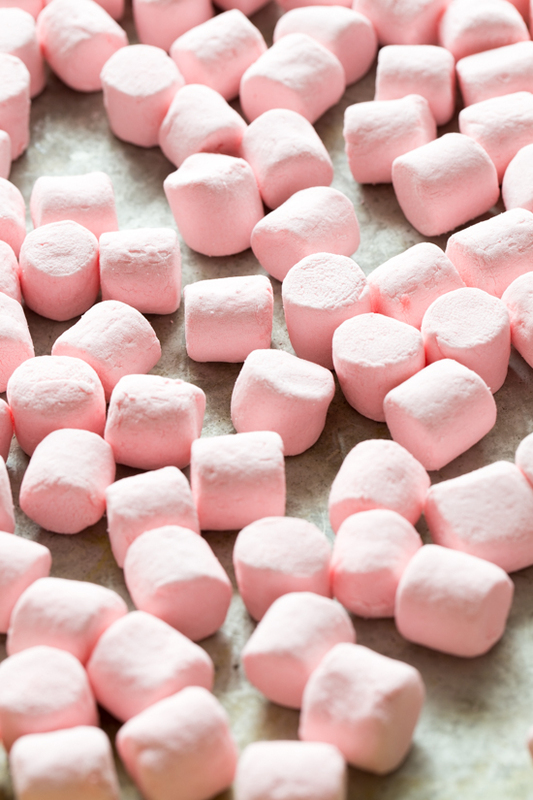 I love the addition of marshmallows – just look at that gorgeous colour! First off, that ice cream looks and sounds amazing! Marshmallow-anything is wicked good. Second, after watching the video, I’d like to point out that you have a lot more room for ice cream in your freezer, and I’m concerned that you aren’t utilizing it. Busted! I totally emptied the top drawer of my freezer because it was over run with partial containers of store bought ice cream and opened packages of frozen veggies and fruit. Not to mention boo boo bags for the kiddos. Ugh, I need to get my fridge/freezer in order 🙂 So what you’re not seeing is a counter full of freezer stuff just off camera that I’m hoping desperately doesn’t thaw in the 30 seconds it took me to get that shot, lol. And you will LOVE this ice cream!! it’s freaking awesome! This looks fantastic! Does 3 bags = 40 marshmallows? Hi Steph! You only need one bag (and not even a full bag) to get the 40 🙂 I realize that was confusing in the video, lol. I just love me some marshmallows 🙂 It took a little bit to figure out how many was a good amount for texture and flavor, and 40 worked perfectly! I always love your videos Emily! I am so impressed. I’ve been wanting to try the no churn ice cream but just haven’t gotten around to it. I knew it was easy, but I didn’t realize it was THIS easy! That’s awesome. P.S. Those key lime marshmallows? OMG. Yes! Marshmallow vodka is fabulous 🙂 I wonder if you whipped coconut cream (I’ve never done it but heard it’s a thing) and used that instead? Not sure what a non-dairy version of sweetened condensed milk is, though. If you come up with a non-dairy version, I would love to hear about it! Thanks so much for stopping by! That’s so good to know, Cara! Now I want to try your version! Hello. Can I use any brand of Marshmallows? Thank you for the wonderful video. Hi Venez! Yes, you can use another brand of marshmallows that you would like. The flavor will be different because the ice cream got a delightful flavor from the Pink Lemonade marshmallows. Also, these marshmallows are more of a medium size, not mini and not the large, so the amount of marshmallows may differ from the instructions here. But the method would be the same! Enjoy! Thank you Emily for your advice and info. Just wondering…would it work to use something like Cool Whip in place of the whipping cream? For me it would just be one step closer to simpler if one thought it would work. Hi Jill, I’ve never tried this with cool whip, so I’m not able to say if it would work or not. If you give it a try, I would love to know how it works out for you! Thanks for stopping by! Great recipe. I really like that you melted the marshmallow, and the pound cake adds great texture! I imagine it is really creamy. So, so creamy! It’s hard to believe it wasn’t traditional custard based, churned ice cream. I hope they like it! My kids couldn’t get enough 🙂 Thanks for stopping by! Mind blown. Love this so much. I love no churn ice cream! Marshmallows, marshmallow vodka and cake? Off the charts, delicious Emily! Love the video too. Videos are definitely on my to do list. I would like to try this recipe but I live in an area where these flavored marshmallows are very hard to find. Where do you get them? Where can I find the flavored marshmallows? I am in Middle Tennessee. Can’t wait to try this recipe! I live in the Green Bay, WI area and was having a hard time finding them too. I ended up finding them at a Walmart super center (the ones that have a big grocery part). Hopefully this helps you out. The original no-churn recipe developed by Cook’s Country (called “magic” ice cream) includes white chocolate chips for added structure and silkiness. The chips are melted in the sweetened condensed milk in the microwave (their recipe uses far less sweetened condensed milk – 1/2 cup – and only 1-1/4 cups of heavy cream.) So you could add the marshmallows to the milk/chips mixture when you nuke it (if you are following the original recipe.) Or you can bypass the melting of the marshmallows altogether by just adding Marshmallow Fluff to the mix, although you won’t end up with that pretty pink color. Is it possible to substitute the pound cake for some other type of cake like dessert like brownies? Absolutely! The pound cake can even be omitted complete and you’ll still have some delicious ice cream. Try regular white cake or even brownie pieces for a different twist. I love no churn ice cream! So delicious! Isn’t it great?! I love the texture – it’s so creamy! Thanks for stopping by!